Because sometimes quiet confidence is just that. May your weekend be filled with both. 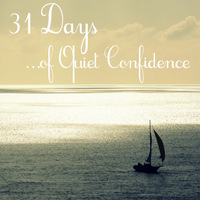 This entry was posted in 31 Days (October 2012) and tagged 31 days (confidence), confidence, quiet, quiet confidence on October 20, 2012 by Emily Gallimore. “I will give thanks to the Lord with my whole heart; I will recount all of your wonderful deeds. I will be glad and exult in you; I will sing praise to your name, O Most High. From the journal . . .
I’ve been reading through the Psalms again this summer. Slowly. Sometimes reading barely a few verses before stumbling on a promise that I so desperately need to hear and savor. Barely twenty chapters in, I have noticed again just how much praise and thanksgiving the Psalmist offers to the Lord in the midst of despair, heartache, fear, unknown, tragedy, and legitimate danger – even possible death at the hand of his enemies. How easy it is in the midst of such hard circumstances to turn our eyes away from the Lord and focus all our attention on the circumstance itself. But as we cry out in desperation, as we turn to the Lord with our complaints and frustrations and anguish, may we never forget to praise in the midst. And in that praise, as we surrender once again and allow the Lord to take over our hearts and lives, as we acknowledge His continual presence in every circumstance, as we recognize His hand that guides, may we find perspective restored, soul refreshed, and trust renewed. 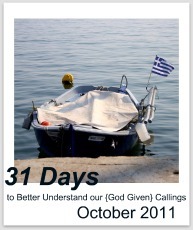 This entry was posted in 31 Days (October 2012) and tagged 31 days (confidence), confidence, praise, psalms, quiet confidence, trust on October 16, 2012 by Emily Gallimore. Earlier this year, I began a faith adventure that was simultaneously terrifying and crazy exciting when I began an application process with an evangelical international missions organization to explore serving overseas with them on a short-term basis for 2 years. I chose to be silent in this space because it just didn’t seem right to share in real time while I was processing mentally, discerning spiritually, and seeking to follow Christ for each “next step” of the process. Not to mention, I chose to keep a relatively small circle of those family, friends, pastors, and mentors around me who knew as well. I’ve gone back and forth as to whether I should share this story now (or even at all), but the prayer of my heart from the very beginning … my deepest desire in this life, really … was, and still is, to know God more, to lean into His Son Jesus Christ, to follow Him with my all, and to make His name known for His fame and His glory. Although ultimately this application process came to a close a couple of months ago as we parted ways prior to any formal training or placement, that prayer can’t be answered if I hide the story. The only way for God’s glory to be recognized in all that He’s done through the process (and is continuing to do) is to share it. I would love to tell you that I handled each unknown twist and turn of this almost-six-month experience with both quietness of spirit and confidence of heart, but that is just not the truth. Yet even in my moments of imperfect (and often lacking) faith, the Lord has been continually drawing me into a deeper confidence in Him. And it’s only as He leads me to abandon my own plans and come to a place of complete dependence on and trust in Him that my soul is able to experience the quietness and rest that it so desperately craves. And that’s what I hope to share with you over the next 31 days – don’t worry, it will be broken up into small and manageable pieces. It’s my story … though really, it’s HIS story … of deeply rooted faith and trust in the sufficiency and sovereignty of Jesus Christ, of beyond-the-intellectual belief that leads to obedience, of following hard after Him even when it’s challenging, and of fixing my eyes on Him for the quiet confidence that only He can give. 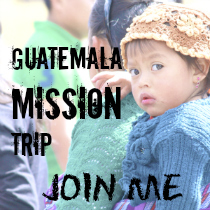 This entry was posted in 31 Days (October 2012) and tagged 31 days (confidence), confidence, faith, missions, quiet confidence, story, trust on September 30, 2012 by Emily Gallimore.